Philippine Airlines (PAL), a trade name of PAL Holdings, Inc. (PSE: PAL), also known historically (until 1970) as Philippine Air Lines, is the flag carrier of the Philippines. Headquartered at the PNB Financial Center in Pasay City, the airline was founded in 1941 and is the first and oldest commercial airline in Asia operating under its original name. Out of its hubs at Ninoy Aquino International Airport of Manila, Clark International Airport of Angeles, Mactan-Cebu International Airport of Cebu, and Francisco Bangoy International Airport of Davao, Philippine Airlines serves 31 destinations in the Philippines and 41 overseas destinations in Southeast Asia, East Asia, Middle East, Oceania, North America and Europe. Formerly one of the largest Asian airlines, PAL was severely affected by the 1997 Asian financial crisis. In one of the Philippines' biggest corporate failures, PAL was forced to downsize its international operations by completely cutting flights to Europe and Middle East, cutting virtually all domestic flights except routes operated from Manila, reducing the size of its fleet, and laying off thousands of employees. The airline was placed under receivership in 1998, and gradually restored operations to many destinations. After PAL's exit from receivership in 2007, PAL embarked on a frequent revamp of management. However, PAL's vision to re-establish itself as one of Asia's premier carriers, is still the matter of greatest importance. Philippine Airlines operates a mixed fleet of Airbus and Boeing aircraft with Airbus A320, Airbus A321, Airbus A321neo, Airbus A330, Airbus A350, and Boeing 777-300ER. The entrance to the Philippine Airlines head office at the PNB Financial Headquarters along Macapagal Boulevard in Pasay City. Philippine Airlines is owned by PAL Holdings (PSE: PAL), a holding company responsible for the airline's operations. PAL Holdings is in turn part of a group of companies owned by business tycoon Lucio Tan. ANA Holdings has also purchased a 9.5% stake in PAL Holdings for US$95 million. PAL is the ninth-largest corporation in the Philippines in terms of gross revenue, as stated in the Philippines' Top 1000 Largest Corporations of 2017. As of April 2018, PAL employs a total of 8,278 employees, which includes 1,332 pilots and 3,016 cabin crew. PAL is the sixty-first largest airline in the world in terms of revenue passenger kilometers flown, with over 16 million flown for 21 million available seat kilometers, an average load factor of 76 percent. PAL has flown approx. 12 million passengers in 2014 and 16 million in 2016. For the fiscal year ending on March 31, 2007, Philippine Airlines reported a net income of US$140.3 million, the largest profit in its 76-year history. This allowed it to exit receivership in October. PAL had forecast net profit to reach $32.32 million for the fiscal year ending on March 31, 2008, $26.28 million in 2009 and $47.41 million in 2010, but this proved difficult to achieve, with a large loss announced in early 2009 causing some concern. However, Philippine Airlines reported a total comprehensive income of $20.4 million for 2014, the company's first profit in four years. The company continued its financial turnaround, reporting a net income growth of 4430.04% for the year 2015. However, PAL reported a loss in 2016, with a net income growth of -38.80%. On November 15, 2018, the airline was named the "Most Improved Airline of 2019" award from airlineratings.com, a product rating website. Philippine Airlines operates a primary hub (Ninoy Aquino International Airport), three secondary hubs (Mactan-Cebu International Airport, Clark International Airport & Francisco Bangoy International Airport), as well as a focus city (Kalibo International Airport), with the majority of routes operating from Ninoy Aquino International Airport. 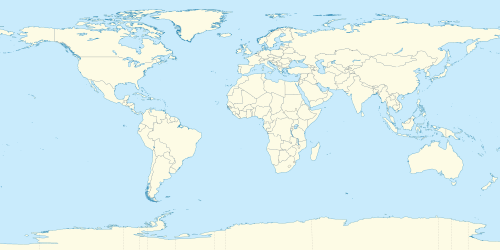 The airline flies to destinations in Asia, North America, Oceania, Middle East, and United Kingdom. Philippine Airlines' destinations (blue) served from the airline's three hubs (red radar signal), excluding domestic destinations. Charter or seasonal services are green while future destinations are yellow. The Philippine Airlines fleet composed of wide-body and narrow-body aircraft from five families (excluding PAL Express fleet): Airbus A320, Airbus A321neo, Airbus A330, its flagship Airbus A350, and Boeing 777. As of October 21, 2018, there were 67 aircraft registered in the PAL fleet. The Philippine Airlines logo has gone under four incarnations in the entire length of its operations. The first logo incorporated a blue oval with "PAL" superimposed in white letters, a four-pointed star whose points intersect behind the "A" in the PAL initials, and a wing whose position varied depending on the location of the logo (the wing points to the right if located on the left side of the plane, left if on the right side). A variant of this logo used a globe instead in the blue oval with the PAL initials superimposed. This logo would be in use from the 1950s until the mid-1960s, when it would be replaced by a second logo. The second logo adopted a blue triangle (with the bottom point missing) and a red triangle superimposed upon it, enclosed by a circle; this was meant to evoke a vertically-displayed national flag (the white being formed by the negative space between the two triangles' tips). In the mid-1970s, a third logo, which removed the circle and simplified the shapes, was introduced. The typeface used in the third logo was later applied to the second logo, which remained the official PAL logo until 1986, when it would be replaced by the current logo. The current PAL logo features the same two blue and red sailed triangles used in the second and third logos. However, an eight-rayed yellow sunburst that is shaped like a Sailboat was superimposed on top of the blue triangle, and a new Helvetica typeface was used. RP-C8785, an Airbus A330-343 operated by Philippine Airlines arrives in Francisco Bangoy International Airport from Ninoy Aquino International Airport as PR1812. Another variant of the original livery used by PAL is somewhat similar to the current livery. However, it uses PAL's third logo on the tail with blue, white and red cheatlines running the center of the fuselage. Later on, the bottom half of the fuselage was also painted white. The current "Eurowhite" livery, first used with the Short 360, was adopted in 1986 following PAL's corporate rebranding. This livery, (designed by Landor Associates) has the name "Philippines" superimposed on the forward portion of the fuselage in italics (using the PAL logo typeface), while the tail is painted with the logo and the Philippine flag is visible near the rear of the aircraft. The PAL logo is also painted on the winglets of aircraft that have them. The name "Philippines", instead of "Philippine Airlines", is to denote that PAL is the primary flag carrier of the Philippines. However, this sometimes leads to confusion that a PAL plane, especially when chartered by the President for official or state visits, is in fact the official air transport of the Philippine head of state. Any PAL aircraft with the flight number "PR/PAL 001" and the callsign "PHILIPPINE ONE" is a special plane operated by Philippine Airlines to transport the President of the Philippines. For the airline's 70th anniversary, a special decal was placed on all of its aircraft. The sticker featured a stylized "70" and the words, "Asia's first, shining through". As the airline celebrates its 75th anniversary, a special decal was put at the back of every aircraft. The sticker features a stylized "75". PAL also placed a 4-star Skytrax sticker on its aircraft to celebrate their new rating. On February 2019, Philippine Airlines rolled out its fifth Airbus A350 aircraft with a "LoveBus" decal that represents the 40th anniversary of partnership with Airbus and to celebrate the airline's signature heartfelt service. The kissmarked "LoveBus" logo was also placed on 1979 in one of PAL's Airbus A300 that represents the first year of partnership with Airbus. Their "LoveBus" A350 rolled out from paint shop and was accepted on February 14, 2019 which was Valentines Day that time, PAL took delivered it 3 days later and was welcomed at Ninoy Aquino International Airport Terminal 2. Mabuhay Miles is the Philippine Airlines frequent flyer program. It was established in 2002 by merging all existing PAL frequent flyer programs prior to the Asian financial crisis: namely, PALsmiles, the Mabuhay Club and the Flying Sportsman, with PALsmiles and Mabuhay Club members being moved to the new program on August 1, 2002. The Flying Sportsman program was subsequently transformed into SportsPlus, a three-tiered, subscription-based program which gives extra baggage allocations for sports equipment. Mabuhay Miles members earn miles that can be redeemed at face value on most Philippine Airlines-operated flights, as well as on code-shared routes of partner airlines. Elite – Passengers who have earned 25,000 flight miles, flown 30 one-way sectors in any class of service, or flown 15 one-way sectors in business class become an Elite member. Privileges include priority waitlist, check-in, boarding, luggage handling (Red tag), and airport standby, additional free baggage allowance of 10K, access to all Mabuhay and VIP Lounges, and tier-based bonus miles (25% on all Philippine Airlines/PAL express flights). Premiere Elite – Passengers who have earned 45,000 flight miles, flown 50 one-way sectors in any class of service, or flown 25 one-way sectors in business class become a Premiere Elite member. Premiere Elite passengers receive all Elite privileges plus waived Mabuhay Miles fees and ticketing service charge, additional free baggage allowance of 30K plus another piece, tier-based bonus miles (75% on Philippine Airlines flights to/from the US or California and UK), and extension of access to Mabuhay and VIP Lounges for one companion. Million Miler – Passengers who have flown one million (1,000,000) cumulative Tier/Flight Miles on Philippine Airlines and PAL Express become Million Milers. All Premiere Elite privileges are given, plus extension of priority luggage handling, airport standby, and boarding to one companion, choice seat, access to Mabuhay and VIP Lounges for two companions, carriage of one sports equipment, additional free baggage allowance of 40K plus two pieces, and priority luggage handling with a MMILER tag. The Mabuhay Lounge is the airport lounge for Philippines Airlines. Mabuhay (Business) Class and Elite Members of Mabuhay Miles (except those taking PAL Express flights) are eligible to use the lounge. The clubs all have open bars and food catering. Between June 15 to August 15, 2015, Philippine Airlines began renovations on the Mabuhay Lounge at NAIA-2. The passenger lounge, which has a seating capacity of 110, reflects a blend of contemporary and traditional design. Each lounge chair is equipped with a power supply, enabling passengers to charge their personal electronic devices. Wi-Fi is available in the lounging and dining areas. On June 27, 2018, Philippine Airlines unveiled a new Mabuhay Lounge for international business class, million millers, premier elite, and elite passengers in Mactan–Cebu International Airport (T2). Philippine Airlines currently offers three classes, Business, Premium Economy, and Economy, depending on the aircraft. Their Airbus A330s and Airbus A350s offer three classes while their B777s, and A320s offer two classes. 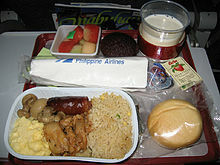 An example of an Economy Class in flight breakfast served for its Manila–Hong Kong flights. In 2017, PAL reconfigured the cabin layout of eight A330s, from a single class 414-seater configuration into a 309-seater tri-class, with Business, Premium Economy and Economy class sections. The reconfigured A330s were rolled out within a seven-month period in 2017. The IFEs were Zodiac's RAVE system. The seats were designed by Lift Strategic Design, and Lufthansa Technik Philippines performed the reconfiguration. Previous aircraft acquired had no embedded IFE, except for Boeing 777-300ERs. Instead, they offered rentable (Economy) or complimentary (Business) iPad Minis with OnAir's wireless IFE solution, OnAir Play. New aircraft acquired have embedded IFEs, due to the failure of PAL's wireless IFE program for long-haul flights. They still offer wireless IFE on all aircraft. Economy class, formerly known as Fiesta Class, is available on all aircraft. Tray tables are found in the seat in front, except for bulkhead and exit seats, where the tray tables are embedded in the seats. They have four way head-rests. B777-300ERs, A350s, select A330s, and A321neos feature seats that offer a pitch of between 31 and 34 inches. Each seat offers AVOD and is equipped with 9-inch(777-300ER) or 10-inch (A330, A321neos) monitors with a headphone jack and USB port for charging, mounted either on the seatbacks or armrests (for bulkhead and exit row seats). They have four-way headrests, and six inches of recline. An articulating seat bottom cushion comes with extra foam under the seat cover. Premium Economy, also known as Economy Plus, is available on A330 and A350 aircraft, as well as PAL Express flights using two class A320s in which case the business class seats are sold as Premium Economy. They are similar in design to standard economy class seats but feature at least 4–5 inches more legroom providing a minimum of 34–36 inches of legroom. Reconfigured A330s, as well as A350s, have a different seat design, with an extra padding layer. It is 9.55" wide, pitched at 38 inches with eight inches of recline. They also feature a 13.3 inch IFE with AVOD, with a headphone jack and USB port, as well as in-seat power. On aircraft without IFE, passengers are also treated to complimentary iPads. Business class, formerly known as Mabuhay Class, is also available on all aircraft. It offers increased legroom and lie-flat seats (on A330-300, B777-300ER, A350-900, and A321neo). Philippine Airlines is the only Philippine carrier to offer business class on domestic flights. On medium-haul and long-haul flights, Philippine Airlines provide amenity kits from L'Occitane en Provence. Boeing 777-300ER, feature angled-flat seats manufactured by Recaro. It is arranged in 2-3-2 configuration. Reconfigured Airbus A330-300 and the A350 aircraft feature lie-flat seats manufactured by Thompson Aero Seating. It has a seating configuration of 1-2-1. A350 and A330 Business Class seats also feature Lantal air cushions, a four-way headrest, a storage shelf for personal belongings, a headphone hook, and a padded inner shell that absorbs noise. Seats feature 15 inch (Boeing 777) 18.5 inch (A330 and A350), and 15.4 inch (A321neo) personal in-flight entertainment systems with AVOD, as well as in-seat power. They feature a USB port where passengers can charge their mobile devices. Passengers are also given noise-cancelling headphones. A321neos also feature lie-flat seats manufactured by Rockwell Collins. It is arranged in a 2-2 layout. The seats feature personal in-flight entertainment system with AVOD, and in-seat power. It has a 60-inch seat pitch and its maximum seat width when fully flat is 23 inches. Business Class seats on A321ceos recline, and have a seat pitch of 39 inches (99 cm). They feature laptop power supply (both AC and USB). There is no IFE built into the seats but iPads are provided on select flights for no extra cost. Although Philippine Airlines aircraft have been involved in a string of accidents since its founding in 1941, the majority of airline accidents have occurred with propeller aircraft during the early years of operations. Few PAL jet aircraft have been involved in accidents, the most notable being the explosion onboard Philippine Airlines Flight 434, masterminded by al-Qaeda, through Project Bojinka. PAL is known for being the only airline in the Philippines to be accredited by the International Air Transport Association with passing the IATA Operational Safety Audit (IOSA), having been accredited in February 2007. Philippine Airlines  has the highest safety rating of 7/7 according to AirlineRatings.com, which was rated the safest airline than some of its Southeast Asian counterparts such as Malaysia Airlines (5/7), Garuda Indonesia (3/7), Thai Airways (4/7), and Vietnam Airlines (5/7). PAL experienced huge financial losses in the late 2000s. On March 31, 2006, PAL's consolidated total assets amounted to 100,984,477 PHP, an 11% decrease from March 31, 2005. On March 31, 2007, the company's consolidated assets continued to diminish by 8% with amount equivalent to 92,837,849 PHP as against to 2006 figures. The declination of PAL's assets was primarily due to net decrease in property and equipment and advance payments to aircraft and engine manufacturers, current and other non current assets. As of March 31, 2007, other current and noncurrent assets fell by 29% to 2,960.4 million PHP and by 20% to 2,941.7 million PHP "due to the effect of re-measurement to fair value of certain financial assets and derivative instruments". After carrying 17% more passengers in 2009 due to acquisition of additional aircraft and growth in the local market, PAL annual income report showed an increase in revenues of US$1.634 billion from US$1.504 billion in 2008. In spite of this, PAL expenses escalated as a result of more flight operations and higher maintenance costs aggravated by fuel prices fluctuations; forty-four percent (44%) of PAL income operating expenditures is utilized for fuel consumption. PAL has a history of labor relations problems. On June 15, 1998, PAL retrenched 5,000 of its employees, including more than 1,400 flight attendants and stewards to allegedly reduce costs and alleviate financial downturn in airline industry as consequence of Asian financial crisis. Represented by Flight Attendants and Stewards Association of the Philippines (FASAP), the retrenched employees particularly the 1,400 cabin crews seek remedy for their problem through judicial process and filed a complaint on the grounds of unfair labor practice and illegal retrenchment. It took a decade before it was finally settled. It passed the Labor Arbiter to the National Labor Relations Commission then to the Court of Appeals and, finally, to the Supreme Court. The Philippine Highest Tribunal favored the aggrieved party and on July 22, 2008, in its 32-page decision ordered PAL to "reinstate the cabin crew personnel who were covered by the retrenchment of and demotion scheme of June 15, 1998 made effective on July 15, 1998, without loss of seniority right and other privileges, and to pay them full backwages, inclusive of allowances and other monetary benefits computed from the time of their separation up to time of actual reinstatement, provided that with respect to those who have received their respective separation pay, the amount of payments shall be deducted from their backwages." The Supreme Court further explained that there was a failure on the part of PAL to substantiate its claims of actual and imminent substantial losses. Although the Asian financial fiasco severely affected the airline, PAL defense of bankruptcy and rehabilitation are untenable; hence, the retrenchment policy is not justified. However, on March 26, 2018, the Supreme Court en banc voted in favor of Philippine Airlines, which affirms the 2006 Court of Appeals decision that says Philippine Airlines is not required to consult FASAP for its criteria for its retrenchment program. For more than 20 years, PAL monopolized the air transport industry in the Philippines. This came to an end in 1995 through the passage of Executive Order No. 219 that permits entry of new airlines in the industry. The liberalization and deregulation of Philippine airline industry have brought competition in the domestic air transport industry resulting to lower airfare, improvement in the quality of service and efficiency in the industry in general. At present, three airlines are competing in international and major domestic routes: PAL, Cebu Pacific and PAL Express (formerly known as Air Philippines) and two airlines are serving minor and short-distance routes: Philippines AirAsia, Cebgo (formerly SEAIR and Tiger Airways) and other small airlines. ^ "Philippine Airlines' international expansion continues with 5 new destinations, A350-900 HGW order". CAPA. Retrieved January 16, 2016. ^ "Board of Directors". Philippine Airlines. Archived from the original on July 14, 2014. Retrieved July 5, 2014. ^ a b "Bautista replaces Ang as PAL president". ABS-CBN News. ^ a b "BusinessWorld – PAL posts slimmer losses". bworldonline.com. ^ a b c "PAL Holdings, Inc. PSE Disclosure Form 17-1 - Annual Report". Philippine Stock Exchange. ^ "Philippine Airlines[permanent dead link]." Pacific Asia Travel Association. Retrieved on October 3, 2009. ^ "About PAL ." Philippine Airlines. Retrieved on May 19, 2009. "PNB Financial Center Pres. Diosdado Macapagal Avenue CCP Complex, Pasay City "
^ Donohue, Ken (April 2012). "Philippine Airlines: Asia's first, striving to shine". Airways (Sandpoint, Idaho). Sandpoint, Idaho: Airways International, Inc. 19 (2): 26–33. ISSN 1074-4320. OCLC 29700959. ^ "Hong Kong, Bangkok eyed for next foreign route of PAL's Davao hub". BusinessMirror. Retrieved October 11, 2018. ^ Philippine Airlines International Winter Timetable Archived December 7, 2013, at the Wayback Machine, Philippine Airlines. Retrieved November 2013. ^ Rey, Aika. "Japan's biggest airline ANA buys 9.5% of PAL shares". Rappler. Retrieved February 16, 2019. ^ Torralba, Mark Jayson (January 3, 2018). "Top 1000 firms show PHL growth story intact". BusinessWorld. Retrieved April 8, 2018. ^ "Mabuhay". Retrieved April 14, 2018. ^ Camus, Miguel R. "PAL flew almost 12M passengers in 2014". Retrieved April 8, 2018. ^ "PAL to spend around $2 billion on 15 new planes in 2018". Rappler. Retrieved April 8, 2018. ^ "History and Milestone". www.philippineairlines.com. Retrieved April 8, 2018. ^ a b "PAL.PH Annual Income Statement - PAL Holdings Inc. - Wall Street Journal". quotes.wsj.com. Retrieved April 8, 2018. ^ "Product rating website picks PAL as 'Most Improved Airline'". Philippine News Agency. Retrieved November 15, 2018. ^ "Philippine Airlines :: Codeshare Flights". philippineairlines.com. ^ "Profile on Philippine Airlines". CAPA. Centre for Aviation. Archived from the original on October 29, 2016. Retrieved October 29, 2016. ^ M.Oertle (February 6, 2011). "''PAL BAC 111-518FG One-Eleven''". Airliners.net. Retrieved February 24, 2013. ^ Cacho, Katlene (June 29, 2018). "Cebu-US flights likely with T2 opening". Sunstar. Retrieved July 7, 2018. ^ a b c "Welcome to Lufthansa Technik Philippines". www.ltp.com.ph. Archived from the original on April 9, 2018. Retrieved April 8, 2018. ^ a b c "Philippine Airlines Set The Bar With A350 And A321Neo Interiors". TheDesignAir. April 30, 2018. Retrieved May 16, 2018. ^ "PAL to roll out tri-class A330s with enhanced Premium Economy". www.philippineairlines.com. Retrieved March 13, 2018. ^ a b c "PAL rolls out tri-class A330 with New Premium Economy". www.philippineairlines.com. Retrieved March 13, 2018. ^ a b c d e f g "Lift designs thoughtful, elegant cabins for revitalised Philippine Airlines - Runway Girl". Runway Girl. July 12, 2017. Retrieved March 13, 2018. ^ a b "Philippine's A330 wireless IFE program will serve as case study - Runway Girl". Runway Girl. August 4, 2014. Retrieved March 13, 2018. ^ "Mabuhay". Retrieved May 16, 2018. ^ a b "#flyPAL4Stars". www.philippineairlines.com. Retrieved March 13, 2018. ^ "What it's like to fly in business class on Philippine Airlines". Business Insider. Retrieved October 10, 2018. ^ a b c d "Mabuhay". Retrieved May 29, 2018. ^ "Philippine Airlines' new three-cabin A330 wows with details". ^ "Airline Ratings". www.airlineratings.com. Retrieved January 16, 2016. ^ Malaysia Airlines Review & Safety Ratings. AirlineRatings.com (October 12, 1937). Retrieved on October 20, 2016. ^ Garuda Indonesia Review & Safety Ratings. AirlineRatings.com (January 28, 1949). Retrieved on October 20, 2016. ^ Thai Airways International Review & Safety Ratings. AirlineRatings.com (April 1, 1977). Retrieved on October 20, 2016. ^ Vietnam Airlines Review & Safety Ratings. AirlineRatings.com. Retrieved on October 20, 2016. ^ Philippine Airlines Income Forces Cost Cuts to Survive Global Recession. Cebu-philippines.net. Retrieved on October 20, 2016. ^ "SC votes after 20 years: PAL wins in retrenchment case vs FASAP". Rappler. Retrieved March 31, 2018. ^ News, Ina Reformina, ABS-CBN. "SC reverses own ruling, says PAL employees not illegally retrenched". ABS-CBN News. Retrieved March 31, 2018. ^ Manuela Jr., W. (2007) Philippine Airline Analysis: The Evolution of Philippine Airline Industry. Wikimedia Commons has media related to Philippine Airlines.